I spent some time today going back to the basics. I have been telling myself for months that I need to review my research to move ahead. I sat down with the information from one of my ancestors that I know I still have many holes. William Robert Jordan was a military man and spent most of his life in the Canadian Military as a soldier and an instructor. William should be an easy subject to follow, census records, military records, and he married 3 times, so marriage records. It is not as easy as it sounds. William was born in Quebec City in 1852 and baptized in 1853. This eliminates the 1851 census but what about the 1861? Nope. 1871? Nadda. 1881 – nothing again. 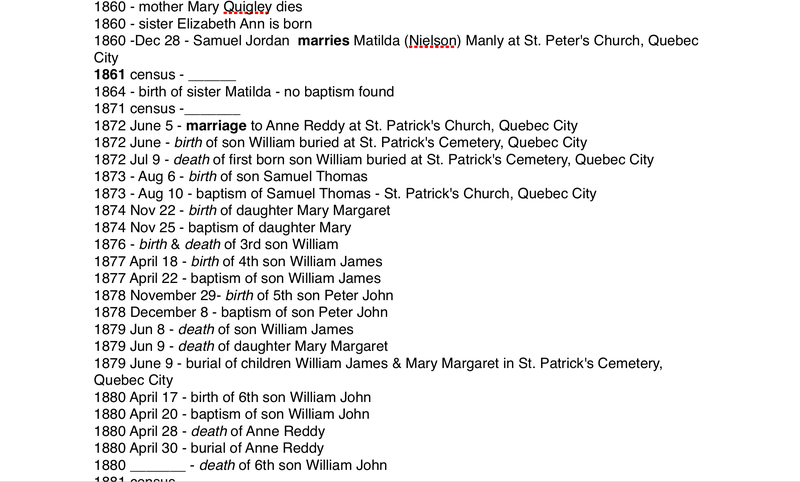 William’s mother died after giving birth to his sister in 1860, no record. Baptism of his sister, not to be found. The time line does not fill in the holes, but the blanks on the page are screaming at me. Where did the Jordan family go after William’s birth? Why are they not on the census? I may never know the answers to these questions but the time line is the key to show me where the gaps in my tree are and from there I can plan a course of action. Hopefully before long some of these gaps will get filled in and I will have a clearer picture of the Jordan family and William.